The Internet of Things (IoT) refers to a network of connected devices collecting and exchanging data and processes over the internet. IoT promises to provide “smart” environments (homes, cities, hospitals, schools, stores, offices, etc.) and smart products (cars, trucks, airplanes, trains, buildings, devices, etc.). While this data is useful, there is still “a disconnect” in integrating these IoT devices with mission-critical business processes and corporate cloud data awareness. However, one of the key concepts in enabling this transition from connected to smart is the ability to perform AI Analytics. The traditional analytic models of pulling all data into a centralized source such as a data warehouse or analytic sandbox is going to be less useful. We are not trying just to analyze complex IoT data, we are trying to make “smart decisions” and take actions base on our AI Analytics of IoT devices. IoT Definition – IoT is the integration of computer-based systems into our physical-world. Our world is increasingly linked through the number of already connected IoT devices. IoT components are equipped with sensors and actuators that enable sensing, acting, collecting and exchange data via various communication networks including the internet. These IoT devices such as wearable, GPS, smartphones, connected cars, vending machines, smart homes, and automated offices are used in areas such as supply chain management, intelligent transport systems, robotics, and remote healthcare. Businesses can rapidly gain a competitive edge by using the information and functionalities of IoT devices (sensors and actuators). So, business processes uses IoT information to incorporate real-world data, to make informed decisions, optimize their execution, and adapt itself to context changes. The power of the IoT device increases greatly when business process (jBPM) can use them to provide information about our real-world as well as execute IoT device actions as part of our business process. The jBPM-BPMN modular allow us to define both the business processes and IoT devices behavior at the same time using one (BPM) diagram. With Arduino Tron AI-IoTBPM we add Drools-jBPM to our IoT devices. Making “Things Smart” is the application of AI to IoT platform via DroolsRules Inference Reasoning, jBPM, and ES-Expert Systems Architecture. With the use of AI Drools-jBPM analysis and reasoning in IoT devices, we can orchestrate dissimilar devices that normally have no awareness of each other. This creates opportunities for direct integration of computer-based into the physical-world that has never been available before. This results in improved efficiency, accuracy, and economic benefits by increased automation – reduced intervention. This IoT orchestration of IoT devices gives us the ability for action after our AI decision. AI-IoT is a mix of Business Processes (BPM) with Business Rules Drools (Reasoning), to define advanced and complex scenarios. Also, Drools Rules Engine adds the ability of temporal reasoning, allowing business processes to be monitored, improved, and cover business scenarios that require temporal inferences. Event stream processing focused on the capabilities of processing streams of events in (near) real time, while the main focus of CEP (Complex Event Processing) was on the correlation and composition of atomic events into complex (compound) events. IoTBPM for CEP is primarily an event processing concept that deals with the task of processing multiple events with the goal of identifying the meaningful events within the IoT event cloud. CEP in IoTBPM employs techniques for detection of complex patterns of many events, event correlation and abstraction and event hierarchies. jBPM is a flexible Business Process Management (BPMN 2.0) that allows you to model, execute, and monitor business processes throughout their life cycle. Business Process Management (jBPM) was established to analyze, discover, design, implement, execute, monitor and evolve collaborative business processes within and across organizations. BPM implements a strategic Goal of an organization. A business process allows you to model business goals by describing the steps that need to be executed to achieve those goals, and the order of those goals are depicted using a (BPM) flow chart. Executable business processes bridge the gap between business, users, developers and IoT devices as they are higher-level and use domain-specific concepts that are understood by business users but can also be executed directly by developers and IoT devices. Additionally, jBPM is an extremely time-sensitive and responsive technology that allows time-critical, dynamic business processes to be changed quickly and while processes are still in progress. This means that jBPM systems can take advantage of the real-time nature of data coming from and going to our IoT devices. This is an ideal fit for our IoT business needs. jBPM supports human-centric, system-centric and hybrid scenarios. In a human-centric scenario, the jBPM system factors in the human element in the business process, putting the person in the center of decision-making and action. This makes it a great match for IoT medical and wearable technology advances. Where is the human role in this increasingly systemized world? The beauty of IoT and jBPM is that technology becomes an important factor for its users. Systems can guide and advise and leave the most difficult decisions to the experts. Hand in hand, users and their system will be better equipped to provide easier, faster and more optimized service. 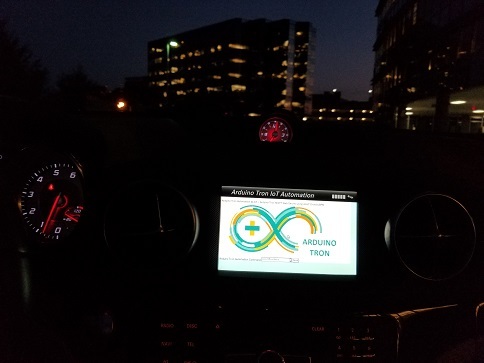 With Arduino Tron AI-IoTBPM the integration between IoT devices and jBPM presents a viable solution with a bright future – one that will connect people, things, and systems together as part of business-critical processes as never before. Arduino Tron AI-IoT Artificial Intelligent Internet of Things AI-IoTBPM Internet of Things BRMS Drools Download PDF Publication.